Tourmaline has the ability to purify the human energy, protect from negative influences and allows for a fast and efficient energy purification. It also aids in releasing stress and reduce levels of uneasiness and anxiety. The colour green in Feng Shui is said to be the colour of growth and healing. Adapting this colour in the sectors which represent wood element are considered favourable. Using them in East and South East is preferred and at times in South which signifies fire element is also acceptable. From fresh spring colour of the newly opened leaves to the strong green of a mighty oak tree —there are literally hundreds of greens to choose from in your Feng Shui applications. Each compass direction in Feng Shui has a special significance and meaning. Hence, using appropriate colours and elements can strengthen specific compass directions and enhance the benefits for the occupants. The colour Green relates to wood and as it’s a bright, vibrant colour, green can “fire” up your recognition and growth. Not just placing green plants in the home but even spending a little time amongst trees and plants can rejuvenate the ‘Chi’ energy of the individual and empower recognition luck. The organs which relate to wood element are stomach, spleen and liver. Much of the internal energy is from the functioning of the liver hence colours of green in the personal attire helps to boost the energy levels. Wearing green will help give you more energy and promote healing if you don’t feel well. Placing a figurine of Green Dragon in the living room in the sector close to 110 to 125 deg helps or even adding green coloured lights as décor in this sector would be sufficient. If you have an East facing front door, the door can be enhanced through Feng Shui energy by painting the door in any shade of either green or brown. To enhance health luck, green crystals aid healing and progress in health. There are many green stones ranging from jade to emerald, however, green tourmaline takes a special place in healing. Suspending a Green Crystal Ball Tassel in the living room, dining room or even in the car can harmonise the flow of Chi, purify the surroundings, invigorate the space to improve the luck and health of family members as beneficial ‘Chi’ flows smoothly in the home. Tourmaline has the ability to purify the human energy, protect from negative influences and allows for a fast and efficient energy purification. It also aids in releasing stress and reduce levels of uneasiness and anxiety. 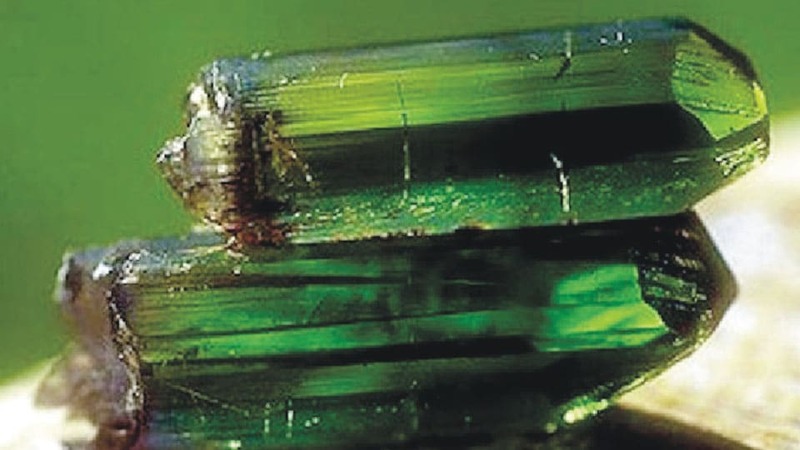 The power of tourmaline to heal and the power of green colour can align the internal energy, bringing in new love, vigour and joy to live life more relaxed. Green Crystals and Tourmaline especially can be beneficial in many ways: • Clear sadness; • Create good health; • Exude joy and happiness; • Attract abundance and wealth; • Strengthen the nervous system; • Create compassion and kindness to others; • Attract success and recognition luck.